Toys are as important as food and sleep for children. They help develop hand and eye co-ordination, social skills, creativity, imagination, cognitive behavior etc. Most expensive toys today may just look attractive, but may not serve the purpose of a toy. 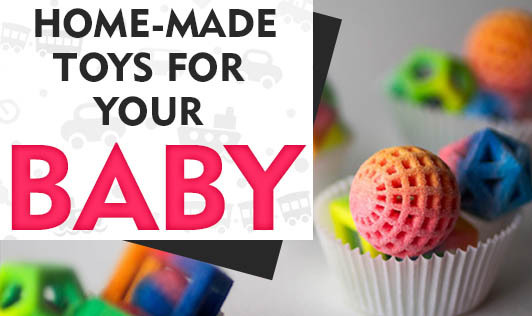 So, instead of buying expensive toys with which your child may or may not play, try these simple home-made toys and enjoy watching your baby have fun and learn! 1.Rattle: Fill a small, transparent plastic box with little rice, dal, pasta etc and put the lid on. Your baby will love watching the contents move and the sound it makes! 2.Puppets: If you're thinking of throwing away an old sock, think again! You can make a puppet out of it by adding colorful eyes, nose and lips. 3.Teether: The best teether you can give your baby is a toothbrush. The added benefit of this is that your baby will be introduced to a toothbrush and the feel of it at a younger age..
4.Bath toys: Give your baby small cups to collect and pour water. You can even punch holes through the cups for your baby to watch the water flow out of it! 5.Drums: Give your baby a wooden/steel spoon and a big plastic box. Let your baby bang the box to his/her heart's content. 6.Treasure box: Keep all your baby's toys in a medium sized cardboard box and let your baby find the toys. You can even keep a new toy and surprise your baby! 1.Pull toys: Cut an egg carton lengthwise to obtain a strip of 6 egg cups. Colour each egg cup with a different color (use non-toxic colours) and draw eyes, nose and a smile. Punch a hole in front of the box and attach a long string to it. You can even put bells inside the box to make it more interesting. 2.Sponge doll: Tie a ribbon just above the centre and top corners of a rectangular sponge. This will be the head and ears of the doll. You can draw the features of the face and a dress for the doll, or even better, you can let your child draw it. 3.Books/albums: You can stick pictures of animals, trees, or your family and friends and write notes about everyone/everything. This will help the child read, write and recognize people. 4.Building blocks: Collect cups, caps tumblers etc which are big enough and cannot be swallowed. You can help your child build towers with it. 1.Avoid using small and detachable parts. It can be a choking hazard. 3.Wash the toys that can be washed to remove dirt. 4.Make sure there are no sharp edges in any of the toys. So here is a way to make a customized toy for your child! It's easy, fun and definitely saves you a lot of money you may waste on some expensive toys!